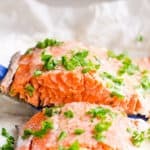 How to bake salmon in foil with simple seasonings in 20 minutes. Healthy, moist and easy. Preheat oven to 375 degrees F. Line large baking sheet with 2 overlapping each other pieces of aluminum foil wider than the baking sheet. On top, place a piece of unbleached parchment paper the length of a salmon fillet. Place salmon fillet skin side down (if any) on top of parchment paper. Rub with olive oil, then sprinkle with salt and pepper. Now you have to seal salmon completely in foil to ensure proper cooking. First enclose salmon in parchment paper – this ensures no harmful chemicals from aluminum are leaching into your food. Then fold the sides of the foil over the salmon to cover and seal it completely. Bake for 20 minutes. 5 minutes before salmon is ready, in a small saucepan melt butter on low heat. Add garlic and lemon juice, stir. Remove salmon from the oven. Carefully open the packet wearing oven mitts and brush baked salmon fillet with garlic butter. Sprinkle with parsley, cut into 5 pieces and serve as you wish. Make Ahead: Follow the recipe up to and including Step 3 but bake any time within next 48 hours.